The local bakery everyone (including me) loves is Some Crust in Claremont, but Local Baker in downtown Upland is awfully good too. A storefront operation a half-block from the gazebo, the bakery is said to date to 1895. An Australian expatriate renovated it, seemingly on a whim, a dozen years ago. The current owners have had the place for five years. I’ve gone there now and then over the years for a muffin or pastry. Local Baker has seating inside and a few tables on the sidewalk under an overhang, perfect on warm days like the weather we’ve had this week. 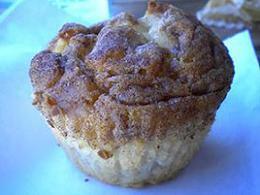 The other day I had an apple muffin ($1.85), a rare item elsewhere, with multiple apple pieces. And at lunch on a different day I had the chicken and lime salad ($8.10), with mixed greens, grilled chicken, cucumber, tomato and cilantro. The lime vinaigrette dressing, served on the side, is very good. 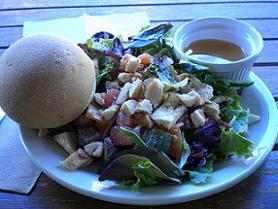 To my taste, it’s one of the better salads I’ve had. Besides cookies, tarts and custom cakes, Local Baker, which most nights is open until 9 p.m., also does sandwiches and a few pizzas. I haven’t had those, but the $5.95 spaghetti with meat sauce and garlic bread, which I tried before a recent council meeting, is disappointing, acceptable but nothing special, although the price is right. Well, can’t win ’em all. Service is friendly, the food (mostly) good. If people-watching opportunities are limited due to low foot-traffic, the setting is at least charming. Local Baker is a bright spot downtown. I’m a sucker for the chubby chef statues in all their incarnations. 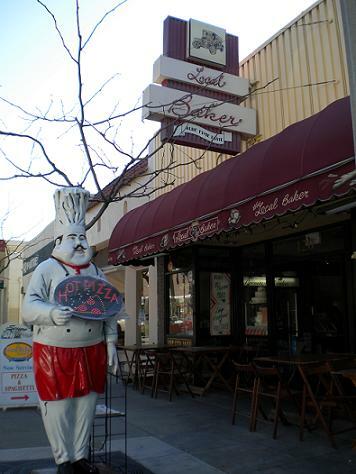 In an area where I didn’t know anything about any of the restaurants, I’d tend to choose one that had a chubby chef statue. Also, when it comes to hamburgers or tacos (only), I believe you can miss an exceptional dining experience by being too picky about the health rating letter in the window. We’ve all heard, “Never eat at a place named Mom’s.” But I would like to hear your and readers’ “rules” for selecting an unknown-to-you restaurant on sight or smell only. I would prefer to allow my sense of smell be my guide. Unfortunately many restaurants don’t actually cook things from scratch anymore (ie pasta sauces, soups etc.). You would be amazed at the variety of food items that restaurants purchase that are delivered already cooked and are basically just reheated. In the years I owned La Piccoletta I had daily visitors who would drop by in the morning while I was cooking my sauces, drawn in by the smells wafting down the alley. By the way it was the best advertisement possible. After I sold the restaurant I ran the “Hub” at Claremont McKenna for a year. My arrabbiata sauce simmering and meatballs cooking in the oven would bring in a stream of students enticed by the smell of real food cooking. It was interesting to note their desire to spend more time in the student center while I was cooking. To me the place does not have to be fancy, I just want it to be clean (and yes that is veryyy important) and have the aromas of food being COOKED on the premises. You were right. It was WELL worth the drive, also the chocolate chip extra special ones. YUM. It made the rainy Saturday seem not quite so gloomy. Will I go back? Try tomorrow. LOL. Thanks for the tip. Always eager for good solid leads… especially if it concerns the all important food group: sweets. Much appreciated and you were ever so right. Thanks for doing the leg work.